Masked Billboard-charting heavy metal group TERROR UNIVERSAL recently announced select co-headline dates with Motograter, and are now thrilled to add another massive tour to their summer schedule – the 2018 Summer Slaughter Tour! 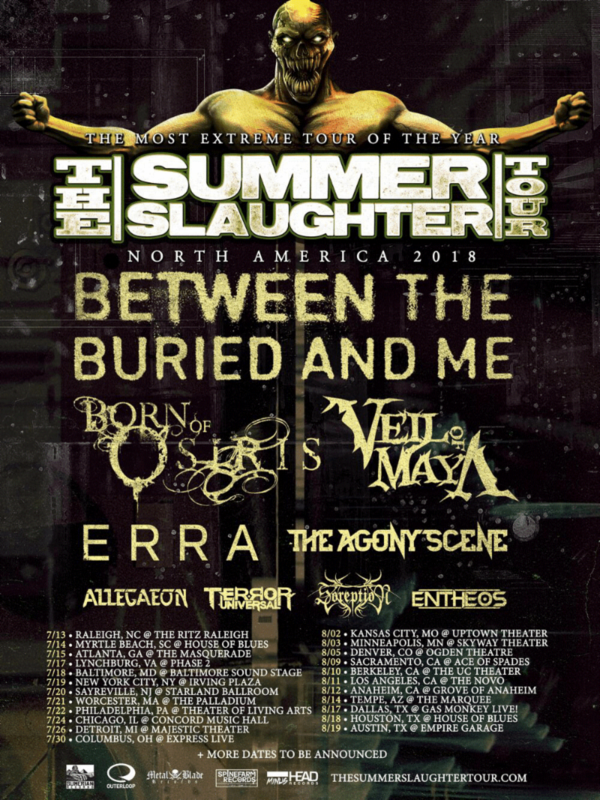 In addition to TERROR UNIVERSAL, the tour will feature headliners Between The Buried And Me, as well as additional support from Born Of Osiris, Veil Of Maya, Erra, The Agony Scene, Allegeaon, Entheos, Soreption and the Headbang For The Highway contest winner (TBA). See below for all currently confirmed North American TERROR UNIVERSAL tour dates. TERROR UNIVERSAL‘s masked marauders – who are also current and former members of hard rock and metal royalty such as Machine Head, Ill Niño, Soulfly, and Upon A Burning Body – began stalking the senses in 2014, releasing the Reign of Terror EP a year later and eventually sharing the stage alongside heavy hitters including Korn, Asking Alexandria, HELLYEAH, Papa Roach, Fear Factory, Incite, and more around the globe. TERROR UNIVERSAL recently released their debut full-length album, Make Them Bleed, via minus HEAD Records. In addition to the seasoned musicians of TERROR UNIVERSAL, Make Them Bleed features the talents of guest bassists John Moyer (Disturbed, Art of Anarchy, ex-Adrenaline Mob) and Tony Campos (Fear Factory, Ministry, Soulfly, Static-X). Make Them Bleed debuted at #8 on the iTunes Metal chart, as well as #13 on the Billboard New Artist chart, #17 on Hard Music, and #165 on Heatseekers (spent three weeks on Heatseekers)! In addition, the album landed at #3 on Metal Contraband’s Most Added chart (#11 overall debut), and #27 on the NACC Loud Rock chart. Stream Make Them Bleed in full via Spotify here, or order it via Bandcamp, Amazon, or iTunes. Check out TERROR UNIVERSAL‘s music videos for “Dig You A Hole” and “Through The Mirrors“, both directed by vocalist PLAGUE.